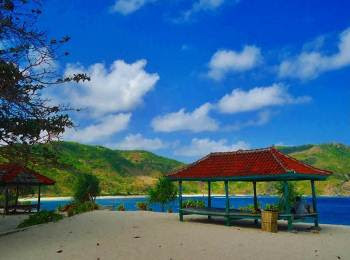 We present you: The Mawun Beach – Lombok. 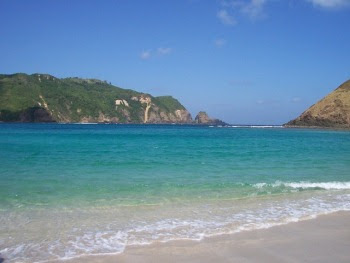 A beach that is still quite close to Kuta beach(Lombok, not the Kuta beach in Bali). Exactly on the same direction, towards the south of Lombok. But you must turn right instead of left when you met the intersection at the end of Kuta. The road is, however, not too encouraging. But full with with exotic scenery along the way. Starting from a row of virgin hills to the sight of white sand from the top of the hill. Mawun is a potential tourist area which takes about two and a half hours from the city of Mataram, the capital of West Nusa Tenggara. 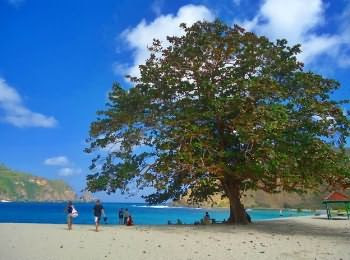 The atmosphere is not much different than other beaches at Lombok: hot and hilly. However, it’s not of limestone hills and barren. Mawun has white sand. The beach is shaped bay so the waves are calmer than other south shore waves. Not dominated by the reefs, so you can safely swim. At the tops of the peninsula there are small hills that can be reached even though there is no climb route. Mawun beach is more like a bow-shaped bay with a deep arch. The hills that flank the beach changes color as the seasons. In the rainy season, green dominated vegetation that thrives by the presence of rain water, while during the dry season it will look brownish. These colors blend with the blue Indian Ocean and white waves that broke out in the distance when hitting each others.This beach is located about 3-4 miles to the west coast of Kuta beach. Words like beautiful, charming, and fascinating are not enough to describe this beach. Unfortunately access to this beach is still quite not good, even more there are rare public facilities built around this beach. Which is a shame on the government!. The sand on Mawun is fine like flour, especially in the middle. The more to the south, the sand grains become bigger. In this section there is also a stretch of black stones mixed with sandy white beach. For those adventurers, there is a quite high hill waiting. At the top of the hill, you can witness the stunning view from the winding coastline. Since it’s flanked by cliffs, it’s very quiet and almost no waves so don’t even think to surf here, but you can swim comfortably. Mawun definitely holds the charms to be framed in the mind or enshrined in a work of photography.